Chinese State Councilor Wang Yong has stressed all-out efforts to treat the injured and deal with the follow-up work well following a deadly chemical plant explosion in east China's Jiangsu province. Wang led officials from departments of the State Council Friday to arrive at the explosion site in a chemical industrial park in Xiangshui county in the city of Yancheng, to guide the rescue and emergency response work, visit family members of the victims and the injured people, and express regards to the rescue teams. 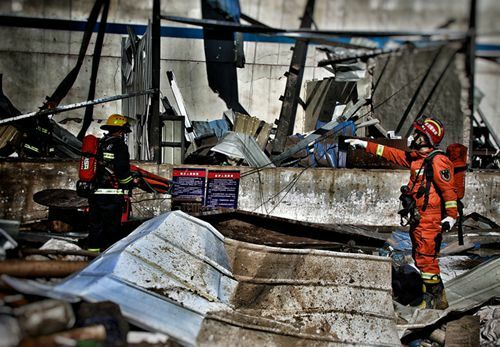 The death toll from the explosion has risen to 64 as of 7 a.m. Saturday after the explosion ripped through a chemical factory owned by Jiangsu Tianjiayi Chemical Co. Ltd. in Xiangshui county at about 2:48 p.m. Thursday. Wang visited the First People's Hospital of Yancheng shortly after his arrival at about 8 p.m. on Friday, consoling the injured people and asking medical workers to do everything to save them. At 11 p.m., Wang presided over a conference at the explosion site. Wang urged Jiangsu officials and all parties concerned to resolutely implement the instructions of Xi Jinping, general secretary of the Communist Party of China (CPC) Central Committee, and Premier Li Keqiang to make all-out rescue efforts with a strong sense of responsibility towards the people. Saving lives is the top priority while best medical resources and experts must be organized to minimize casualties, Wang said. Every corner must be searched over and over again for the victims, and every injured person must be rescued, he said. Hazardous chemicals and pollutants must be promptly dealt with, while environmental monitoring on air, soil and drinking water must be strengthened to avoid secondary disasters, Wang said. Wang also ordered timely and accurate disclosure of authoritative information to respond to public concerns. Thorough probe into the blast shall be carried out in a timely manner and those responsible shall be held accountable, he said. Wang visited the injured at the People's Hospital of Xiangshui Saturday, then went to the explosion site again to discuss follow-up rescue measures, and offered condolences to family members of the victims at their homes. Wang was sent to the site by General Secretary Xi Jinping and Premier Li Keqiang to guide the rescue work on behalf of the CPC Central Committee and the State Council.